FILE - An immigrant child looks out from a U.S. Border Patrol bus leaving the U.S. Border Patrol Central Processing Center in McAllen, Texas, June 23, 2018. When kidnappers assaulted a woman on a Guatemala City street and ripped her infant daughter from her arms, DNA testing came to the rescue. A positive match helped reunite mother and child after the baby turned up abandoned at a church with no identification. In addition to identifying kidnap victims, DNA tests have helped connect adoptees with their biological parents and U.S. immigrants with their families. Now, DNA technology is being called upon to bring together families separated at the U.S.-Mexico border. Migrants' advocates, however, say using genetic testing in this way raises technical, legal and ethical issues. While several companies have offered to donate kits, leading migrant rights groups have turned them down. Genetic tests have helped an organization called DNA-Prokids reconnect more than 1,000 missing children with their families in Mexico, Nepal, Thailand and several other countries, including the kidnapping case in Guatemala City. Jose Lorente, a professor of forensic medicine at the University of Granada in Spain, started the organization. Lorente said he was moved by the children he saw on the streets in cities around the world. Many were victims of trafficking and had parents who were looking for them. Lorente said he hopes to establish a worldwide network of DNA testing labs to help children everywhere. "This is a way to send a message to people trafficking children," he said. "The message is, from now on, it is not going to be so easy to steal and traffic a child because he or she will be immediately identified." Lorente said DNA tests could help make sure children coming across the U.S.-Mexico border are not being trafficked. 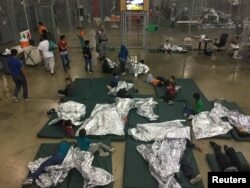 FILE - A view inside the U.S. Customs and Border Protection detention facility shows children at Rio Grande Valley Centralized Processing Center in Rio Grande City, Texas, June 17, 2018. "It's going to be a small percentage," Lorente said, but added there may be cases in which ill-intentioned adults claim children who are not their own. U.S. officials already use DNA tests to confirm that immigrants seeking to join relatives in the United States are related. Genetic testing led the U.S. State Department to suspend a refugee program in 2008. Suspecting fraud in the family reunification program, officials tested about 3,000 applicants, mainly from Somalia, Ethiopia and Liberia. They confirmed a parental connection in less than 20 percent of the cases. The program restarted in 2012, requiring a DNA test to prove that a parent and child are related. New technology could enable those tests to be conducted at the border in as little as 90 minutes. Law enforcement agencies are evaluating rapid DNA tests that can match a person in police custody to a database of known criminals. The same technology could be used to test migrants. Thermo Fisher Scientific has offered to donate $1 million worth of its rapid test technology to help reunite families separated at the border. That followed offers from two ancestry companies, 23andMe and MyHeritage, to donate their technologies to the effort. "Who's going to keep that information?" asked communications manager Fernanda Durand with the migrant rights group CASA. She is worried the government could use migrants' genetic fingerprints later without their consent. "It's very troubling," she said. Standard DNA tests can only reliably identify parent-child and sibling relationships. In refugee situations, advocates say, it's not unusual for someone other than a child's biological parent to care for him or her — for example, if a parent has been killed or detained. The ancestry companies' tests look at much more genetic information than standard DNA tests and can identify broader relationships; but, they can also generate much more sensitive data, including health information, and that would need to be protected. These tests also are not certified for this purpose by the organization that accredits DNA testing labs. Plus, "Most of these migrants probably don't have a high school education and have never encountered DNA in their lives," noted genetic counselor Kayla Sheets, founder of Vibrant Gene Consulting. "How can they give informed consent [to be tested] if they don't understand the technology?" "This is a very, very vulnerable population," Sheets added, and extra safeguards need to be in place when dealing with their genetic information. "And I'm just not certain that these companies, nor quite frankly the government, [are] quite set up for that yet." 23andMe and MyHeritage say they are sensitive to the privacy concerns and will offer the tests only to legal aid groups working with migrant families. Those groups have said, "Thanks, but no thanks," according to communications director Jennifer Falcon at the Refugee and Immigrant Center for Education and Legal Services. Separating parents from their children is bad enough, she said. "We don't believe you can solve one civil rights violation by creating another potential violation with their privacy," Falcon added.